Sonoro designs and engineers high quality audio systems in Germany and delights music lovers around the world with its products. With lots of joy, creativity and understanding, Sonoro uses innovative technology combined with colourful and trendy materials to give music form, colour and above all powerful sound. 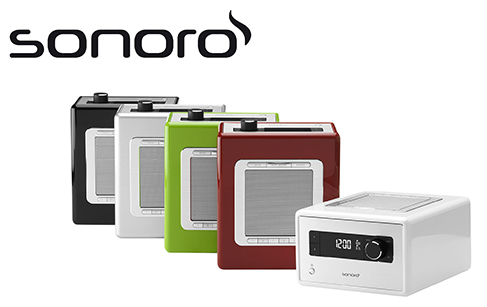 The in-house colour mix, a superior material selection, the unique Verve Edge Design with curved corners – all these characteristics define and form the unique character of the Sonoro brand and its products. Sonoro brings music to people – whether stereo sound from your iPad in the living room, as an alarm clock on the night table, listening to your favourite CD during a kitchen party or the newest MP3 track for a barbecue by a lake. Sonoro products do not set limits to your listening experience.